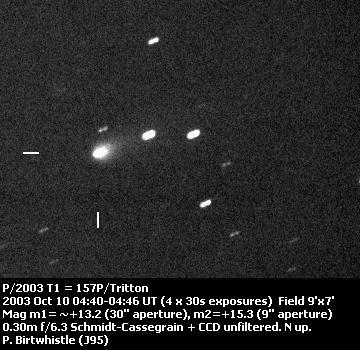 Charles Juels (Fountain Hills) repeated his success from the end of 2002 (C/2002 Y1 Juels-Holvorcem) by picking up a 13th magnitude comet in the dawn sky using a 5" f/5 "comet seeker" with a CCD on 6th Oct 2003. He subsequently found prediscovery images from 22 Sep 2003. 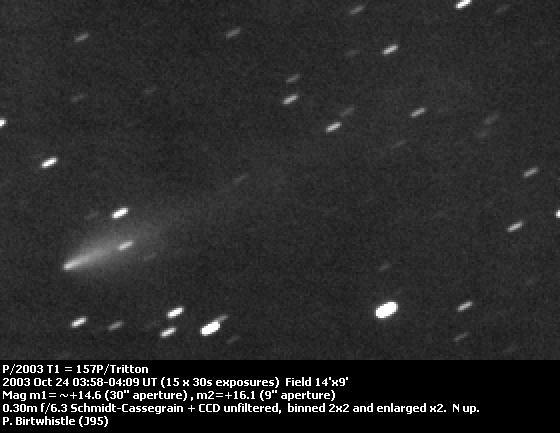 Rather than being a new find, this one turned out to be the lost comet D/1978 C2 (Tritton) which was only observed for a month in 1978 (see IAUC's 3175, 3186, 3194, 3198). At discovery it was apparently undergoing a major outburst, being about 6 magnitudes brighter than expected from the 1978 return. 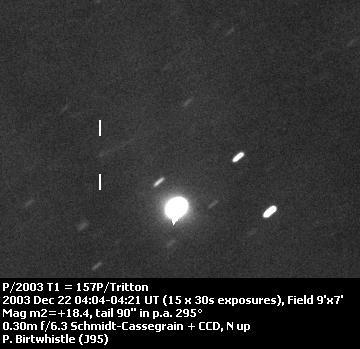 It was at perihelion on 24th Sep 2003, 2 days after being first imaged. 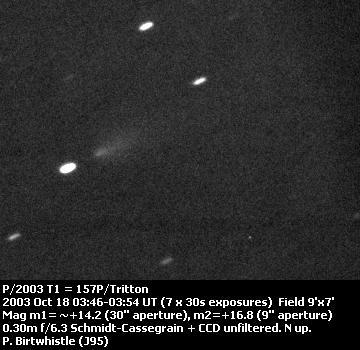 Rapid fading is evident between images obtained on 10 and 18 Oct 2003, with the comet becoming more diffuse. Both images have the same scale and orientation, but the second image has almost double the exposure. Further images a week later show a well defined coma and significant tail. The exposures on 24th and 25th Oct 2003 are 7.5 minutes, about double that of 18th Oct 2003. The scale is the same as the previous images, but the field of view has been extended. 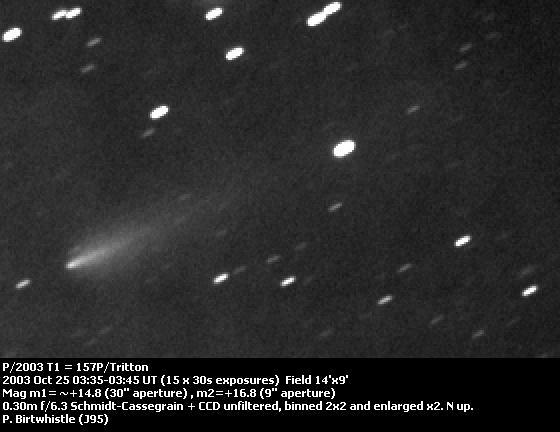 When next imaged two months later the comet had faded dramatically. The ephemeris indicates that the comet should have faded just 0.4 magnitudes in that time, but the measured magnitude shows a drop of nearly two magnitudes. The image scale is the same as all the other images on this page.